You can fill your sock drawer with hundreds of socks, but it won’t mean anything unless you purchase them from a reputable manufacturer. If you go with an unknown brand in an attempt to save cash upfront, you're going to wind up spending more money in the long run in order to replace the ones with holes (which will likely be most of them). By expanding your budget by just a couple of dollars, you’ll be able to get your hands - or feet - on high-quality socks from a high-quality brand. Take, for example, the Dress Flat Knit Socks from Dockers. Many premium-quality mens dress socks prominently display the emblem of their designer in an attempt to create brand awareness, which is understandable but more than a little inconvenient if you don’t want your colleagues to be staring at your feet all day. Similarly, they often come in bright colors or bear outrageous patterns, which is the last thing you want if you’re looking for a pair of socks that won’t leave you in possible violation of your office’s dress code. Dockers Dress Flat Knit Socks, however, are available in plain colors, making them perfect for formal wear. Despite their bland appearance, they are expertly designed and will last you for years when properly cared for. Dockers Dress Flat Knit Socks can be purchased for less than $15, meaning you can stock your sock drawer without making the slightest dent in your bank account. Because they are available in full colors and bear no discernible patterns or designs, Dockers Dress Flat Knit Socks are ideal if you frequently find yourself in formal situations where bright colors are considered out of place. As a consequence of this, however, these socks are not the greatest option for individualists who want everything they wear to be an extension of their personality. Included in one pack of Dockers Dress Flat Knit Socks are 5 pairs of socks, each one primarily composed of polyester and with a non-binding stay-up top to ensure a secure fit without risk of leaving a mark. While some sock brands offer warranties, Dockers doesn’t include any such thing with its Dress Flat Knit Socks, meaning you may have some trouble obtaining a refund or replacement should it be needed. Dockers Dress Flat Knit Socks are available in 3 different colors, those colors being black, charcoal, and khaki. Unfortunately, each pack is limited to a single color, so if you want 3 different colors you’ll have to make 3 different purchases. As mentioned already, these cotton polyester blend socks feature polyester as their primary material, but they are also composed of cotton, spandex, and nylon, which gives them the most heavenly combination of comfort and fit. They will contour themselves to fit the shape of your foot, so you’ll no longer have to worry about trying to discreetly shift your socks while sitting at your desk. The nice thing about plain socks is that they can be added to any outfit without detracting from it. 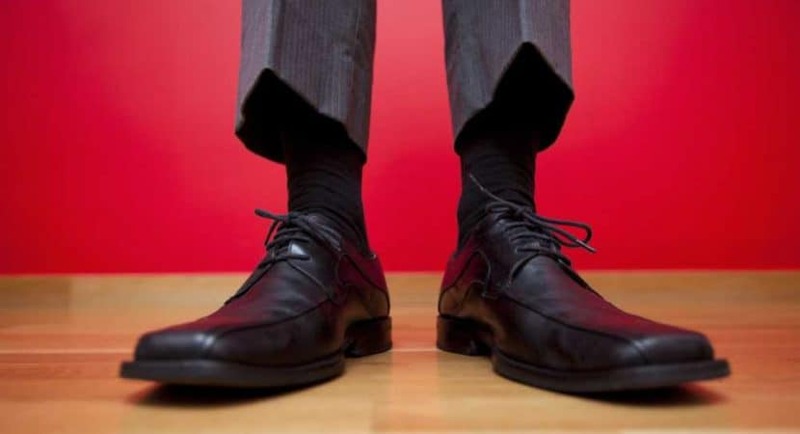 That being said, the slim fit of the Dockers Dress Flat Knit Socks means that they are arguably best suited to slim fit clothing, so you should definitely consider purchasing them if you like form-fitting suits. It’s also worth pointing out that these socks are quite high and will crawl up to just below your knee, so whatever you do don’t wear them with shorts! If your office dress code isn’t particularly strict and you have the privilege of wearing colorful clothes to work, these plain socks may not be for you. If you’re looking for something a little more funky, we suggest going with the Boldfoot Socks Quality Pack. 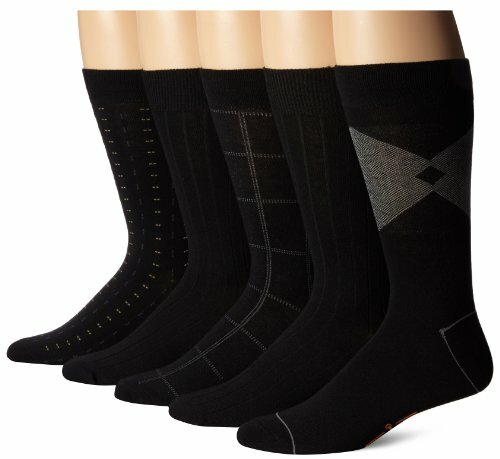 Because of the manufacturer's reputation, the Boldfoot Socks Quality Pack will set you back a little more than the Dockers Dress Flat Knit Socks, but for your money you’ll receive 3 uniquely patterned socks, each one bearing a multitude of colors to take your socks from a bit player to the anchor of your outfit. Who would have thought socks could be so complicated? As tedious as the research process can be, you can take comfort in the fact that it was all worth it because Dockers Dress Flat Knit Socks are among the finest socks not manufactured with a visible designer label. In fact, you can take literal comfort in these socks because their polyester-cotton blend means a snug fit and breath ability, while most cheaper socks can only give you one of those things if they give you either at all. For the office worker who is tired of routing through their socks every morning for a pair with no holes or inappropriate patterns, there is no better choice than Dockers Dress Flat Knit Socks.